Approximately 30% of total global greenhouse gas (GHG) emissions are from the agriculture, forestry, and other land use (AFOLU) sectors. There is increasing interest in identifying sources and sinks of GHG emissions due to the rising negative impacts of climate change. This has resulted in the creation of GHG accounting tools that allows the quantification and reporting of GHG emissions. One such tool is the CGIAR Research Program for Climate Change, Agriculture and Food Security Mitigation Options Tool (CCAFS-MOT), which calculates emissions from a variety of crops, rice, grassland and livestock. This tool is distinct in that it provides a range of mitigation options that are ranked in order of mitigation potential. This paper investigates benefits associated with the mitigation options presented in the CCAFS-MOT other than emission reduction. Co-benefits include increased yield from crops and livestock, improved soil quality and fertility, and reduced production costs, all of which can help improve food security and alleviate poverty. MacSween K, Feliciano D. 2018. 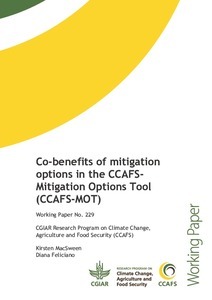 Co-benefits of mitigation options in the CCAFS-Mitigation Options Tool (CCAFS-MOT). CCAFS Working Paper no 229. Wageningen, The Netherlands: CGIAR Research Program on Climate Change, Agriculture and Food Security (CCAFS).